International Blues Fans Mourn the Loss of B.B. King and Celebrate his Legacy & Influence, Plus Live Music Highlights This Week! The 2012 documentary film B.B. King: The Life Of Riley can be viewed in its entirety on YouTube and offers a viewpoint of King’s life story taken from candid recent interviews with King himself by filmmaker Jon Brewer. The film is at its best in telling the story of King’s early life including his birth to share-cropping parents who died early, his time spent living with his equally poor grandmother and his determination, even as a youth, to be a person of good character and also a person committed to music. 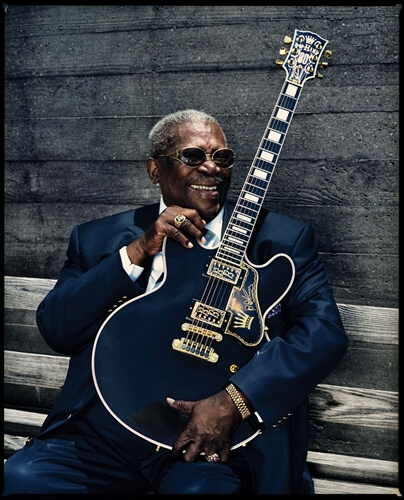 The film also features rare interviews from King’s close family members, friends, and includes many significant blues and rock musicians providing commentary on King’s influence on contemporary blues and on his signature, extremely influential string-bending, electric guitar playing. This week’s shows bring some all-star talent to the metro. Last year’s special Cate Brothers show was spectacular, and the band is back for a show Sunday, May 24, 6-9 p.m. at The 21st Saloon. The Cate Brothers rarely play live shows any more so this is a real treat for music fans. Their harmonies and the catalog of classic tunes they popularized during their recording career make for a tremendously entertaining and musically satisfying show. Earl and Ernie Cate were roots music artists that broke through into the Top 40 in the 1970s. The Cates also worked with Levon Helm, a lifelong friend, in a 1980’s version of The Band. The Cate Brothers features Terry Cagle on drums and additional vocals, Cagle is Levon Helm’s nephew. Helm mentored Cagle on the drums and Cagle’s version of some of Helm’s tunes is uncannily close, in a very natural way, to Helm’s own performances. The Cates are still based in Arkansas, and brother Earl hits the area often with his band Earl & Them, featuring Cagle and former Lincoln guitarist Jason Davis. Lots of great music is on tap at Lincoln’s Zoo Bar including two shows by Zoo favorite Billy Bacon, who plays Thursday, May 21, 6-9 p.m. and Friday, May 22, 5-7 p.m.
Jessica Hernandez & The Deltas bring their jangly soul-pop to the Zoo Friday, May 22, after 9 p.m. See jessicahernandezandthedeltas.com. Rachelle Coba is up at The Zoo next Wednesday, May 27, 6-9 p.m. Coba has lived in both Kansa and Florida, where she currently resides. She has represented the Wichita and Topeka, Kansas, Blues Societies in the International Blues Challenge (IBC) in Memphis, Tennessee. She has competed in both the solo act and band competitions, and was an IBC semi-finalist in 2013. She was nominated in the Blues Blast Music Awards for Best New Artist Debut Album (alongside Lincoln’s own Shawn Holt and Josh Hoyer). Classical training influences her fingerpicking style. Coba’s love of the blues has led her to play as a guitarist with bands for Super Chikan, Albert Castiglia, Grady Champion and Ray Drew. None other than Matt “Guitar” Murphy says “She plays the hell out of the guitar.” Liberty Press raved “Hotter than Georgia asphalt in the summertime.” Find out more and listen to her music at rachellecoba.com. The 21st Saloon serves up a double bill of great music Thursday, May 21, with the long anticipated return of blues harmonica virtuoso Jason Ricci and his band. Ricci was just featured on the cover of the May 7 issue of Blues Blast Magazine, which called him “among the very best in the world” at his craft. Blues Blast noted, “Ricci, at 41-years-old, is now a seasoned veteran of the blues scene and is rightfully heralded as one of the most innovative and creative harp blowers around.” Ricci was invited to be part of the Rock and Roll Hall of Fame induction performances honoring the late, great Paul Butterfield. See bluesblastmagazine.com/featured-interview-jason-ricci for the full, informative and introspective interview. This should be an excellent show. Also performing is the Oklahoma blues band George Keen & The All Nighters, featuring local audience favorite Michael Newberry on drums, formerly of the Scott Keeton Band and Watermelon Slim & The Workers. See georgekeen.net. Mark your calendar for a Hoodoo favorite and great blues-jazz-R&B keyboard man Bruce Katz and his band coming up at Lincoln’s Zoo Bar Wednesday, June 3, 6-9 p.m. Katz is a musician’s musician who has toured with Greg Allman, Delbert McClinton and performed at the Blues Foundation’s Blues Music Awards on May 7 with the great John Hammond. Katz is a multiple Blues Music Award nominee in the Pinetop Perkins Piano Player of the Year category. Katz is touring behind his first solo album in a few years, Homecoming. See brucekatzband.com. Memorial Day weekend offers some fine outdoor music fun including the big annual Lippy’s BBQ Blues Fest Saturday, May 23, noon to midnight. Lippy’s is located at 125 W. 2nd in Malcom, Nebr., near Lincoln. Performing are Shawn Holt & The Lil’ Slim Blues Band, Billy Bacon & His Porkestra, The Tijuana Gigolos, The Mezcal Brothers, The Geezers, Sh*thook, Sweeney/Stearley and The Bottle Tops. Admission is $12. Bring your own chairs and blankets. Food and beverages for sale on site. See the schedule and other details facebook.com/lippysbbq. Sugar Clay Winery is always a fun outing at a venue full of character and history. Sugar Clay WInery is located at 1446 240th Avenue, Thurman, IA. Sugar Clay WInery celebrates Sunday, May 24, with their 10th Annual Winestock. Music by Hector Anchondo, Carson City Heat, Matt Cox, Jack Miller and Aly Peeler. Gates at 1 p.m., music at 2:30. Food and beverages for sale on site. Admission is $10, see sugarclaywinery.com. On the heels of B.B. King’s passing, it was learned that Omaha also lost an iconic blues figure. Ron Alexander aka Dr. Spit, a longtime member of The Blues Mechanics, passed away unexpectedly on May 15, in Springfield, Mo., according to family members. Alexander had been living recently in Springfield. There will be a blues jam and celebration of life for B.B. King and Ron Alexander Monday, May 25, 7 p.m. at The Love’s Jazz & Arts Center, 2510 N. 24th St. (24th and Lake St). The event is co-sponsored by the Blues Society of Omaha and the Love’s Jazz & Arts Center. Soul Chef’s, Dr. Spit’s daughter’s and son’s business, will provide catered food for the event. If you are interested in performing, please contact Tim Clark to coordinate your participation in the tribute at 402-306-2734.